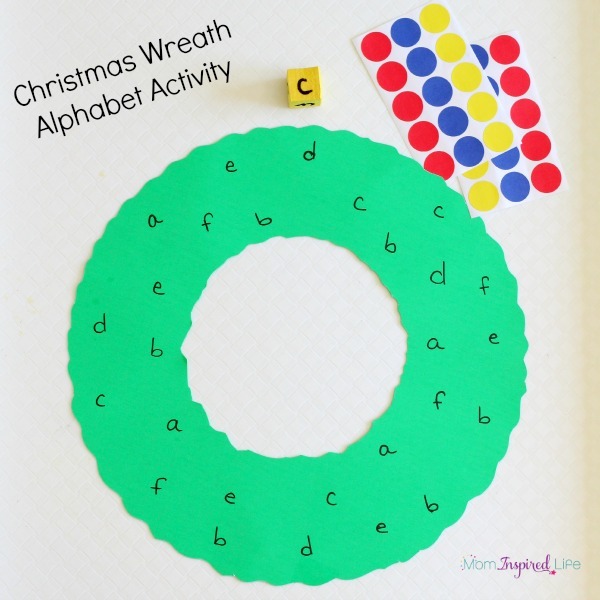 This Christmas wreath alphabet activity is a fun and simple way to practice letter recognition and letter sounds. 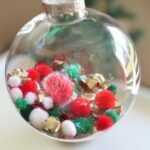 It’s also a great Christmas craft! 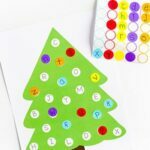 If you’re familiar with my blog, you know we like to do letter matching activities and alphabet roll and cover activities. This time I thought we would make a Christmas wreath. I also decided that I would like to be able to hang it up and use as a decoration, so I chose to make it a roll and cover activity. 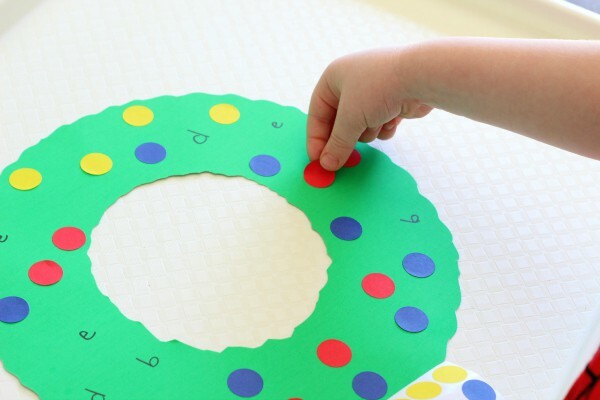 This way all you see at the end of the activity is a pretty and colorful Christmas wreath! 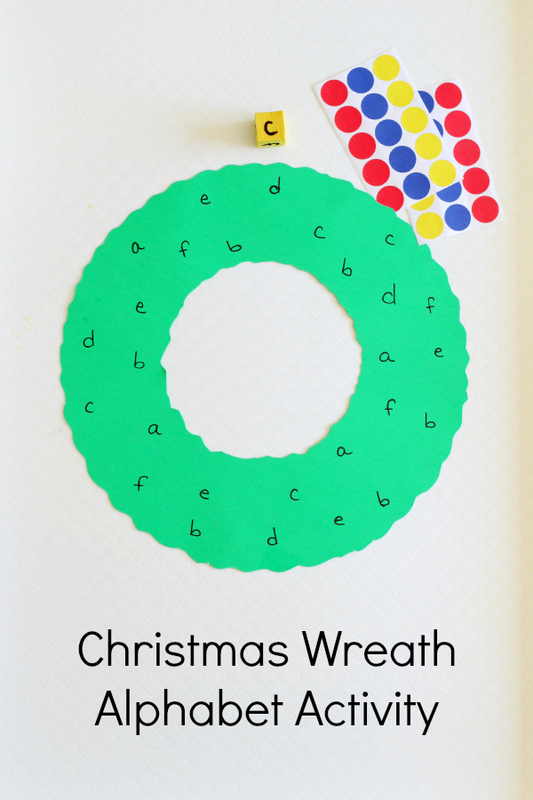 You could even skip the whole alphabet part and just decorate the wreath with dot stickers. That’s what my two-year old did! I traced a medium-large sized bowl onto the green poster board. Then I placed the smaller bowl in the center of that circle and traced it. 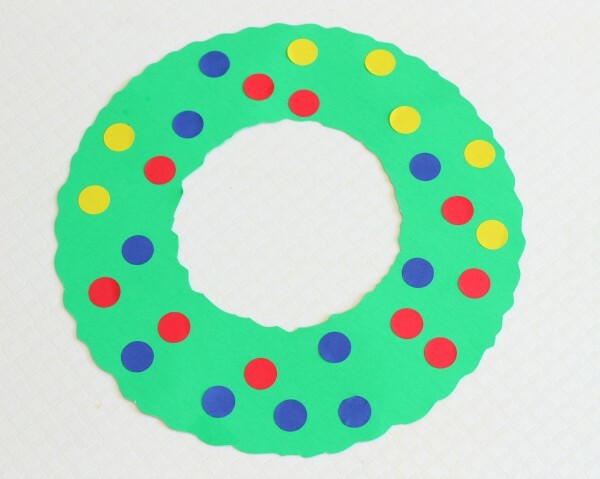 I then cut around the edges of the two circles so it looked more bushy like a typical wreath. You could skip this and just leave the edges smooth. Whatever your personal preference is. I chose 6 different letters and wrote them all around the wreath. I wrote those same 6 letters on a small foam cube to use as a game die (dice). 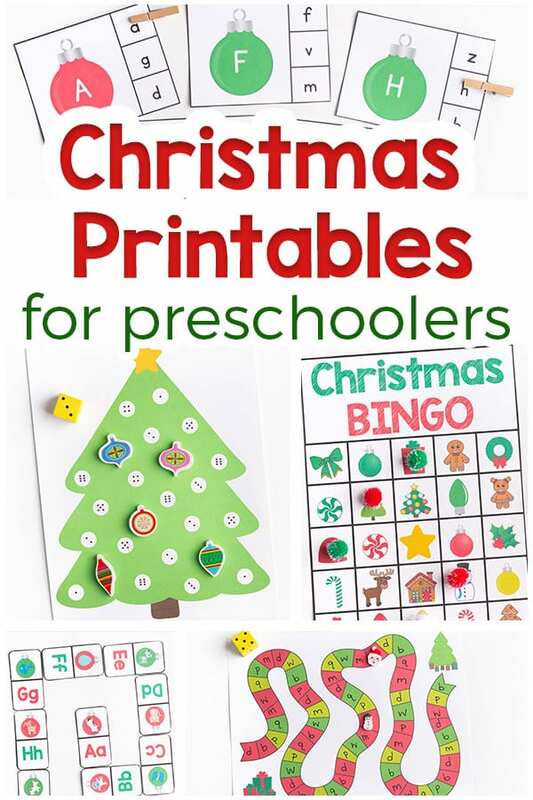 Check out the Christmas printable bundle for even more fun and learning! 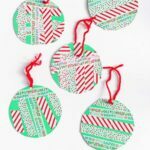 This Christmas printables bundle is jam-packed with fun Christmas-themed learning activities and games for kids ages 3-6. 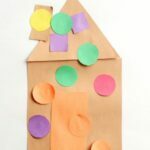 With over 100 pages of printable activities, this printable pack is sure to keep the kids busy this holiday season! My son rolled the game die and then identified which letter was facing up. On occasion, I also asked him what sound the letter made. Then he removed a dot sticker from the backing and placed it over one instance of that letter on the wreath. This continued until all of the letters were covered with dot stickers. By the end he was cracking up because he kept rolling the same two letters. We were doing all sorts of funny moves to try to get the die to land on one of the letters he still needed to cover with a dot sticker. 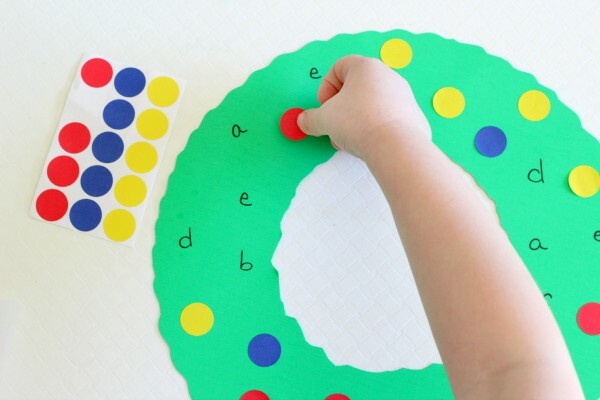 Overall, it was a fun way to practice letter identification and letter sounds, develop fine motor skills and make a pretty Christmas wreath! 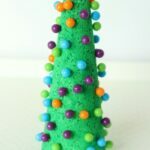 This post is a part of a Christmas series I am doing with Jaime from Frogs, Snails and Puppy Dog Tails (FSPDT). 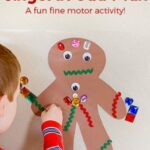 This week we shared Christmas alphabet activities. 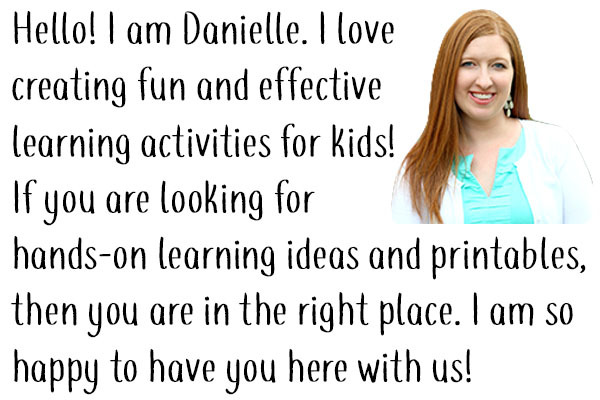 Head over to her site to see her Alphabet Sort and Fine Motor Skills activity. Check out links to the other posts in the series below!